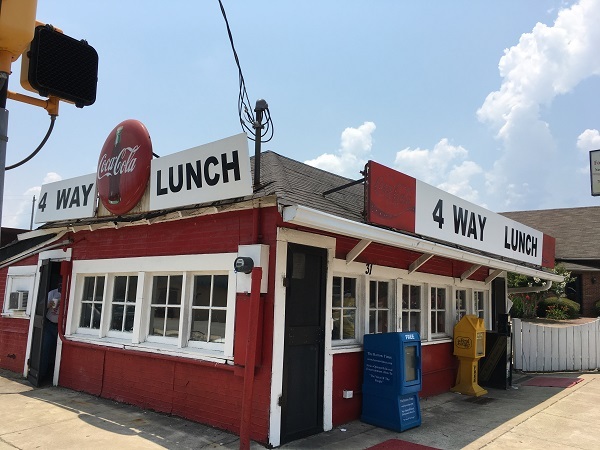 4 Way Lunch, Cartersville GA – Marie, Let's Eat! The week before we moved into our new place in Chattanooga, Marie had to go to Nashville for a week’s training and the girlchild was away with family. So my son and I had a few days to get into trouble, and also shuttle some carloads of boxes to the public storage unit down the street from our new place. 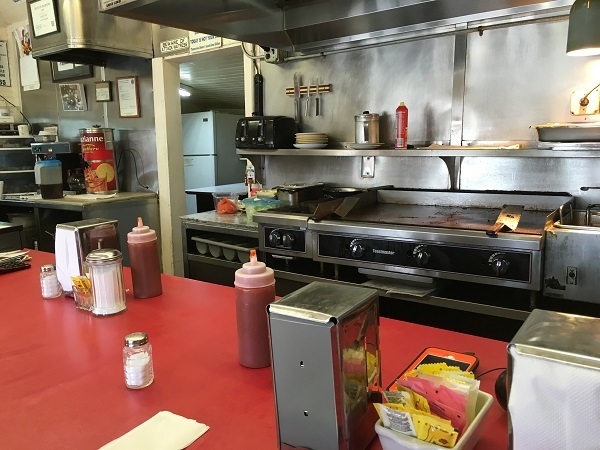 Going back and forth and back and forth, it occurred to me that my son would certainly enjoy a few hours at Tellus Science Museum just north of Cartersville, and this would finally give me a chance to try a burger at a classic greasy spoon nearby. 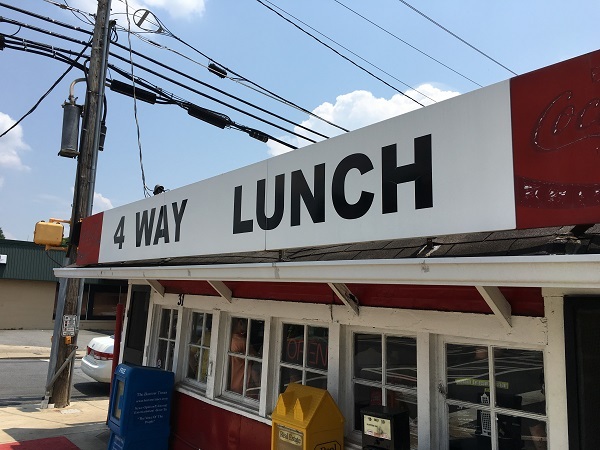 The 4 Way Lunch is a local landmark. It originally opened in 1931 and survived a devastating fire that forced its closure for several months in the 1990s. It’s a humble little joint with room for eight at a time at the long bar, and a separate entrance in the rear with room for three more. That’s the old separate-but-equal entrance from the days of segregation. Guests who are waiting for a seat at either counter line up with their backs against the front window. It’s not really a place where you should expect to linger; people probably would like your bar stool. And the people are so incredibly friendly! This is absolutely not a place to bring a book and expect to read it. Having a constantly-yammering five year-old who’s just spent a while with dinosaurs was an icebreaker, but even if he hadn’t been with me, I bet I’d have been chatting with the guests on either side of me and the employees working the grill. This is a place where people are constantly catching up on the latest news and asking how everybody’s family is doing. If you arrive a stranger, you may well not leave as one. This burger was a whole lot messier than I anticipated. They offer one with chili, mustard, and onions, but, as you see from the picture, this is not a dry mix of spiced ground beef. 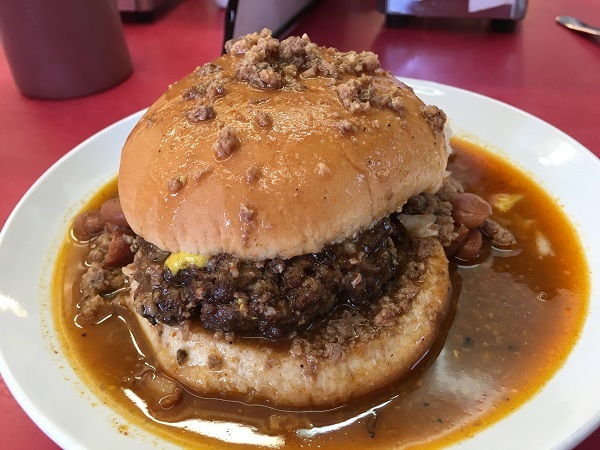 This is a big ladle of thin, soupy, chili with beans that drowns the burger completely and demands you eat it with a fork. They’ll also do the same thing to your burger with gravy if you ask. Should the road ever take me back this way, I’d like to try one a little less wet. The meat is ground fresh every morning. This was really good, don’t get me wrong, but my son and I definitely ate healthier that evening. We had light salads and gelatin for dessert. My son, sensibly, just had a plain burger without all the extra mess. I enjoyed the heck out of it, started the car and got the air conditioning going, took some photos, and felt so heavy that I asked him to drive me home while I napped. I bet if Marie hadn’t been in Nashville, she’d have let me nap. Darn kid. Posted on August 21, 2016 by Grant G.Posted in atlanta, burgers, georgiaTagged atlanta, burgers, cartersville, diners, georgia. And a special note to our longtime commenter R.E.W., yes, this will be our last Georgia post for the next few months. Thank you for reading! You’re sweet! I will still be reading. I’m also reading Friday Date Night, Atlanta Restaurant Blog, and The Cardigan Kitchen to get my Atlanta food fix in your absence. Fine bloggers all! Check the blogroll on the sidebar for some more good ones to read! You should have ventured just down Main Street to Agans Bakery. An old time bakery. Deliciousness sums it up. Oh, wow! You’re right; I don’t have a tooth as sweet as Marie’s, but a box of petit-fours would have made a nice “welcome back” gift for her after her five days’ training. Thank you for the suggestion. Do you recall if it is open on Sundays? That might make a nice little side stop on our way home. They are not. 😦 Just 9-3, Monday-Saturday.